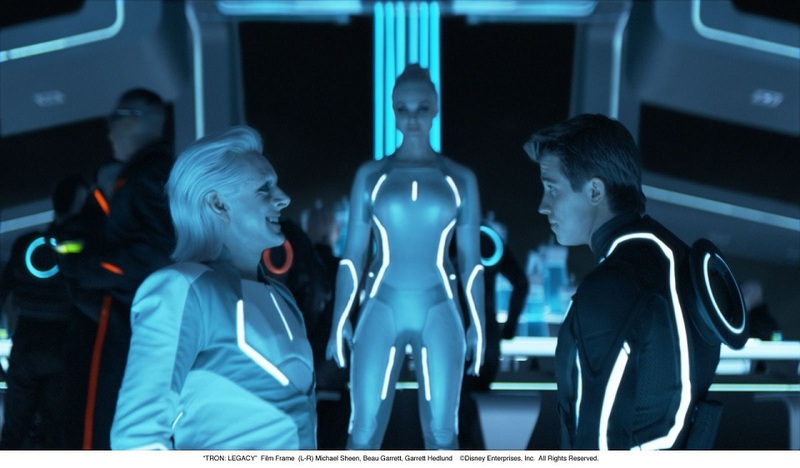 TRON: LEGACY: The Cyber-Future Is… Murky At Best – Schlockmania! 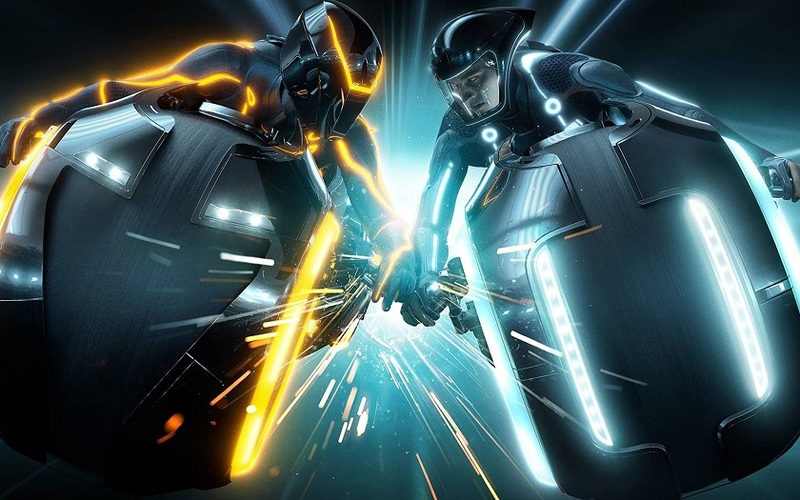 Of all the holiday blockbusters coming down the pike for the 2010 holiday season, Tron: Legacy easily has the biggest geek-controversy atmosphere surrounding it. Some are calling it a shameful disaster and a smaller circle of fans are already staking out a claim for its potential “misunderstood classic” status. Films that inspire this curious blend of reactions are usually misfires and that is the case here – but what kind of a misfire is Tron: Legacy? The story tries to pitch the film both as a direct sequel and its own franchise-starter. This time, the focus is Sam Flynn (Garrett Hedlund), the son of the hero of the first film, Kevin Flynn (Jeff Bridges). The senior Flynn is working on a top-secret project when he suddenly disappears, leaving his son an orphan and his company, Encom, to be taken over by soulless-corporate types. Sam grows up surly and rebellious in his father’s absence but has a piece of his dad’s freedom-fighter instinct – as shown in a fun prologue where he swipes Encom’s new operating system out from under their noses to distribute it free on the internet. However, Sam is forced to put aside the chip on his shoulder when Alan Bradley (Bruce Boxleitner), Sam’s surrogate dad/buddy of his father/human alter-ego of Tron, approaches him with the news that Kevin sent him a text the other night from the old arcade he used to own. Sam checks it out and a computer-assisted laser defragments his body into bytes, hurling him into the cyber-world. After some fighting via data-disc throwing and light-cycles, he discovers that his father is alive in the cyber-world b ut locked in a battle of wills with the dictator-like Clu (also Bridges), a computer-program doppelganger that wants to take over the real world. There’s also Quorra (Olivia Wilde), Kevin’s gorgeous cyber-assistant, who catches Sam’s eye. As the above synopsis indicates, Tron: Legacy has plenty of material to work with but the end results have more width than depth in terms of story. Re-establishing the storyline and setting up the two worlds eats up about half of the film’s running time. Once the real conflict begins around the midpoint, it’s rather simplistically laid out. The inner workings of the future world are both expansive and vague, as is the war of wills between Kevin and Clu. The complexity of juggling the narrative demands of a sequel, a franchise reboot and a story/concept recap for the unfamiliar result in a film where the exposition tends to smother the characters and their relationships. 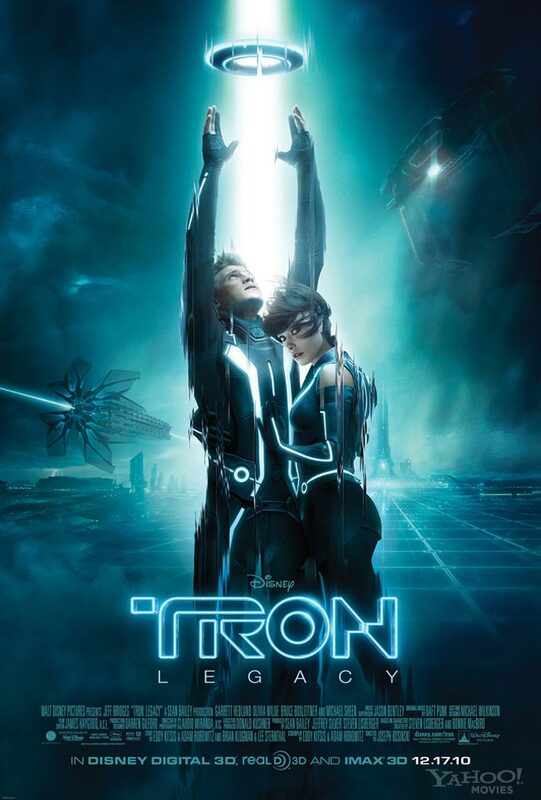 Worst of all, Tron himself is an afterthought despite being name-checked in the title. His character is hastily worked into the final third, being made a major part of the finale’s action despite getting almost no face time and none of the character moments needed to lay out any sort of an ar c for him. The “have it both ways” approach taken to his character reflects the many problems of the storyline, which attempts to be multiple things for multiple viewers without ever really satisfying anyone. That said, Tron: Legacy has some virtues. The minimalist visual design will please those who go for this approach, updating a number of concepts from the first film in appealing way and the Daft Punk score blends orchestral and electronica elements in a manner that is truly dazzling. Director Joe Kosinski handles the look better than the storyline, blending CGI and impressive sets in a way that gives the film a consistent look (even i f the physical layout of the cyber-world itself isn’t so clear). The action in the big disc-fight and light-cycle scenes delivers the fun Tron fans are hoping for. Mileage will vary for individual viewers dependent upon their patience with the story itself but Your Humble Reviewer found the film to be engaging as an audio-visual experience: it’s not a game-changer but the scope of the spectacle can be pretty hypnotic. 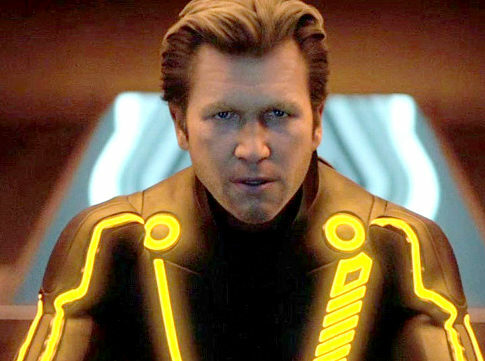 Also, the acting in Tron: Legacy has more variety than you usually get in a blockbuster. Hedlund underplays but this fits the nature of his characterization (which is admittedly sketchy in places). Bridges does well in his dual role, even if the Flynn side of things channels a little too much Big Lebowski, and his ability to play both roles seriously goes a long way towards keeping the audience engaged. Wilde is impressive as Quorra, projecting a wide-eyed sense of wonder that harkens back to the original film in a charming way. That said, Boxleitner might be the most intriguing of the group: despite minimal screen time, he carries himself with a gravitas that will make fans of the original smile (and wish that this script gave him more to do). The one real question-mark in terms of performance is a bizarrely camped-up turn by Michael Sheen as a creepy club-owner who seems to have wandered out of The Fifth Eleme nt. 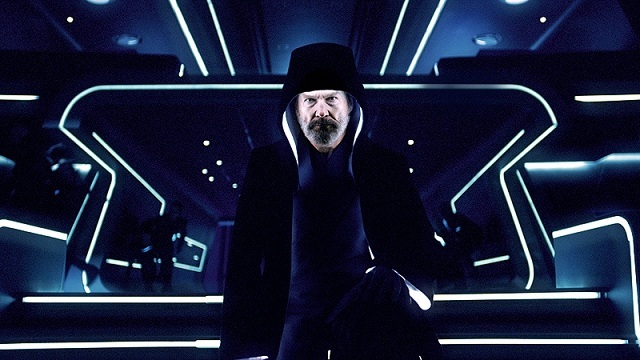 Ultimately, Tron: Legacy is a misfire on conceptual terms, too burdened by the weight of its multiple aims to give the story room to breathe, and it often feels like the opening act of a bigger miniseries instead of its own self-contained film. That said, it’s an interesting misfire that offers a lot to look at and listen to. Despite the many problems laid out in this review, the film is not humiliating in a fan-betraying Phantom Menace sort of a way nor is it overblown and visually incoherent a la Michael Bay. It’s not going to be the beloved smash that Disney was hoping for but it’s a lot more viewer-friendly that other big-budget misfires and may establish a cult of its own based on its audio-visual appeal… a set of circumstances that will allow it to follow in Tron‘s footsteps in an eerily apropos manner.